I love scallops. Him Outdoors is, at best, lukewarm on the subject. Offer him anything with curry flavours, though, and he warms up to chilli heat pretty fast. That sentence looks a bit suspect in retrospect, but you get my drift. This is based on a Shaun Rankin recipe via Great British Chefs but I changed the dhal according to what I had on hand. It’s a knock-out: the creamy, lightly spiced lentils complement the curry-crusted scallops without overpowering the delicate flavour of the shellfish. I could happily eat this about once a week. Put the lentils in a small pan and add enough cold water to cover them by about an inch. Bring to the boil, skim off any scum, then add the turmeric and a knob of butter. Cover and simmer gently until they’re soft, stirring occasionally. In a small frying pan, dry-fry the cumin seeds for a minute or two, then pour into a bowl and put to one side. In the same pan, melt another knob of butter and gently fry the garlic, shallots and chilli until the onions are soft and golden. Add the chopped tomatoes and toasted cumin seeds and stir through. Stir this into the lentils, which should be quite porridgy by now, and add the creamed coconut and chopped coriander. Season to taste with salt and pepper, stir well to mix and set aside to keep warm. Wipe out the frying pan. 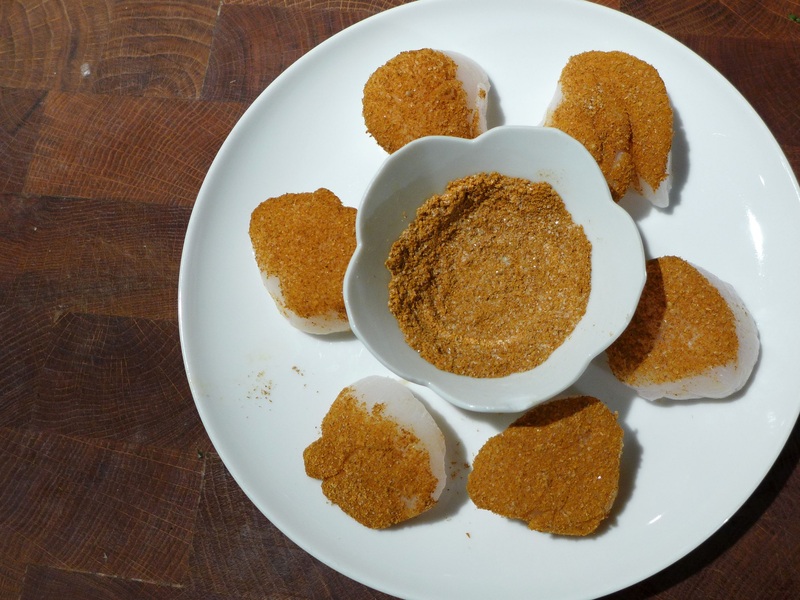 To cook the scallops, mix the curry powder and salt in a bowl and dip the scallops into it, one side only. Tap off any excess and put them on a plate, spiced-side-up. Put the frying pan on a high heat and once it’s searingly hot, add about a tablespoon of olive oil, just enough to coat it. Put the scallops in spiced-side-down, and cook for one minute, then turn them and brown the other side, another minute. If you arrange them like a clock face, starting at 12 o’clock and moving clockwise, you can remember in which order you put them in the pan and therefore which needs to be turned first, so they’re all cooked the same. 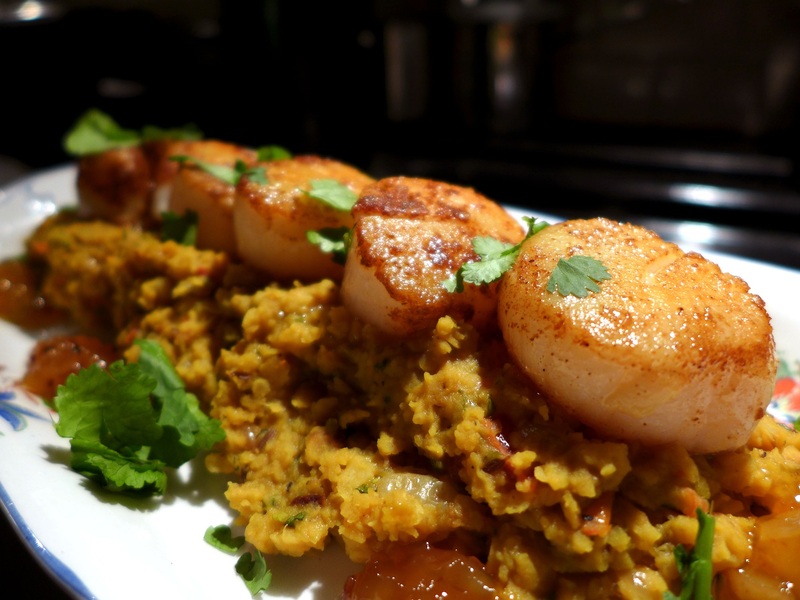 Spoon the dhal onto warmed serving plates and sit the scallops on top. Scatter over the coriander leaves and dot the plate with mango chutney (preferably one with little chunks of mango in it). Eat at once. 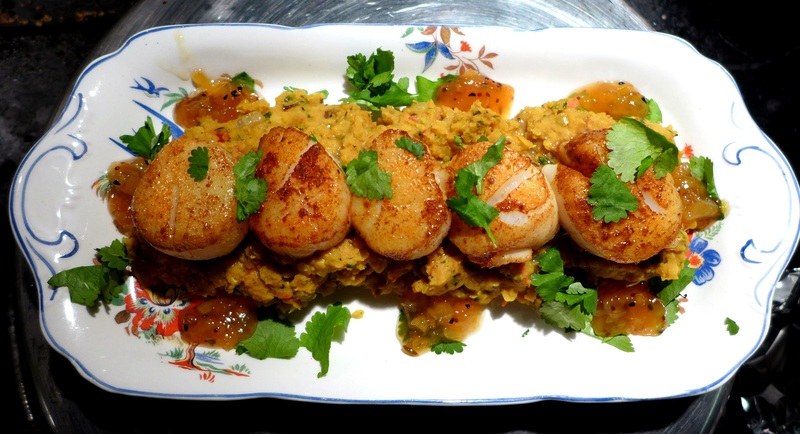 This entry was posted in Fish and shellfish, Soups, starters and canapes and tagged curry-crusted scallops, spiced scallops with coconut tarka dhal, tarka dhal with creamed coconut by Linda Duffin. Bookmark the permalink. I’m naturally suspicious of anything with scallops that doesn’t involve them being flash fried and guzzled immediately. This gives one pause for thought. Very nice Mrs. P.
Thanks. Well, they are flash-fried but the quick dunk in curry works really well. I thought it might overpower the scallops but actually it gives them just a hint of spice. Lovely! Hi Linda, really love this recipe! Would you mind if we shared it on our website? Full credit would be given to you and we will link back to your blog. Faye. Hi Faye, thanks for having the courtesy to ask. I’m very happy for you to share it providing, as you say, that it’s credited and you link back to Mrs P. Cheers, Linda. Never got to the curry part, sheer greed made me eat the scallops alone (ok, with peas). Chicken pot pie for the mussel averse. Next time, we’ll try again. Lol, good excuse to buy more scallops! Exactly, next week we’ll have them with your lovely Tarka Dhal! I though I’d seen this combo before. 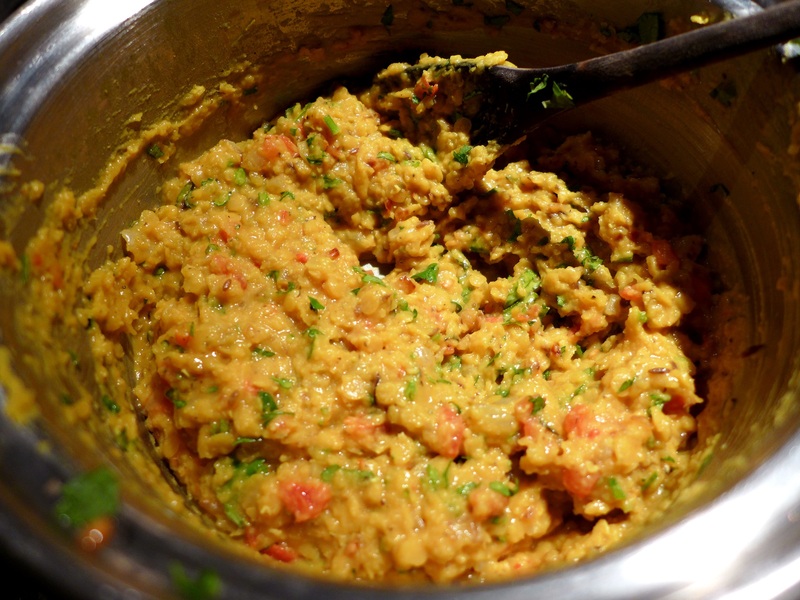 I love your version of coconut dhal.